OneCoin affiliates in Romania have attracted the attention of authorities, who are looking to recover €400,000 in unpaid taxes. The anti-fraud division of the National Agency for Fiscal Administration (ANAF), has identified 7.59 million RON ($1.8 million USD) collected by OneCoin affiliates. The invested funds were laundered out of Romania by the affiliates. Rather than declare the full amount collected, the Romanian OneCoin affiliates only declared transfer fees. In addition to drastically reducing owed tax, the ANAF alleges this was done to “preserve the appearance of (OneCoin’s) legality”. 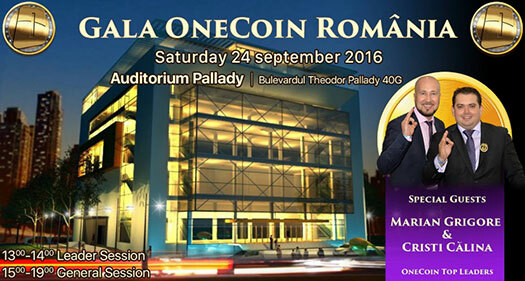 The Romanian OneCoin affiliates carried solicited and laundered funds overseas through an unnamed shell company. The ANAF states the shell company had no ties to Romania, other than its use to launder invested OneCoin funds offshore. This is in line with OneCoin’s money laundering practices elsewhere in the world. The ANAF advises they have notified prosecutors of the alleged tax fraud, however whether anything further comes of it remains to be seen. OneCoin affiliates being busted for tax fraud of all things in Romania is somewhat ironic, seeing as the company has been holding promotional events across the country for years. Outside of tax fraud, whether Romanian authorities care about or are even aware of the $4.6 billion dollar Ponzi scheme is unclear. Great! The authorities are working all over the world to definitively stop the onecoin ponzi fraud. This weekend is the moment for authorities to act as the scammers have a big convention in Romania. Wait and see if something happens !